One frosty morning in early December I headed down to the beach to fill a missing photo gap for the book. I needed to take a photograph of a Sea Fan on the strandline. These are beautiful colonial creatures which I’ve seen diving off the Devon coast. They have a well branched structure like that of a tree and along all the “branches” are hundreds of little polyps that look like minute anemone which feed on passing plankton. Sadly, angling line often catches the delicate but tough branches and rips the whole colony from the sea bed. Ultimately they end up washing up on to our beaches and the little polyps disappear to leave what is often described as looking like a miniature tree. It always saddens me to see these slow growing colonies washed up in angling line knowing just how beautiful and important a habitat they are. As I turned the corner on to my familiar beach I was stopped in my tracks by the sight of a much larger object on the strandline that I really didn’t expect to see. Strewn along the length of the strandline was a tangled pile of monofilament nets with hundreds of dead fish or Bass caught up amongst the line. Some of the fish had their heads caught in the holes of the net, mouths agape seemingly trying to escape the grips of the net. On closer inspection others had the fine line well caught up around its gills and catching on the spines of their dorsal fins. My heart sank as I examined the contents of the net and looked to my familiar shores knowing that now our coastal waters were empty of bass. This is even more heart-breaking considering this area of coast is a designated bass nursery ground. The nets had been deployed in the mouth of the estuary where surfers enjoy, on the occasion, some perfectly formed rollers. This is also the area where Bass migrate up the estuary to spawn. Sometimes when you’re surfing on a hot summer’s day you’ll see the silver glint of Bass swimming below you in the crystal clear water. As a result of sights like this, many of the local surfers are very protective of their local beloved coast. Indeed as I took photos of this net on the strandline a surfing friend came by to tell me that the net had been deployed while he was in the water a few days earlier! The net is perfectly designed to be unseen by fish (or surfers) and sufficiently entangling to hold man or fish in its grips. Divers call this type of fishing net a, “wall of death” for obvious reasons. Another surfing friend passed to say that a month earlier she had detangled a young Cormorant which had got caught up in a net like this. She managed to place the bird on the end of her board where it spread its wings before moving on. 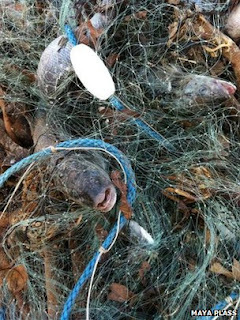 In fact three nets had been washed ashore in the last six months with a loss of approximately 1000 fish. Discovering the net was a mix of emotions. On one hand I was relieved it had washed up on to the shore and on the other disappointed to see the blatant disregard of safety or sustainability. If left in the water, the entangled fish will decompose or get eaten rapidly and the net becomes clear again to drift through the water to catch yet another haul - whether that be dolphins, bass, divers or surfers. At least here on the seashore the Inshore Fisheries Conservation Association were able to remove the net away from harms way. It was interesting to chat to the IFCA officers and gain a greater understanding of their valuable work. Legal loopholes means that it’s not always easy to catch perpetrators but the more “intelligence” from the general public they can get on illegal activities the easier their job becomes. Locally, we were also able to raise awareness about this issue by getting the local BBC Spotlight and newspaper to come down and make use of this highly visual statement of rotting, wasted fish. These images are powerful but also very useful. We are often reminded to question where our fish comes from when we go to the fishmonger or restaurant and source sustainable options. Here, in these images, we have all the proof needed as to why that is so very important. Perhaps it might encourage us to make sure we always ask and then, at least, this tragic waste has had a purpose after all.